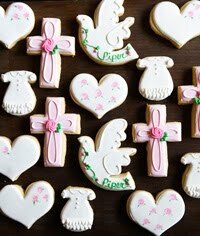 I'll tell you exactly where the inspiration for the cookies came from: the Paper Source catalog. 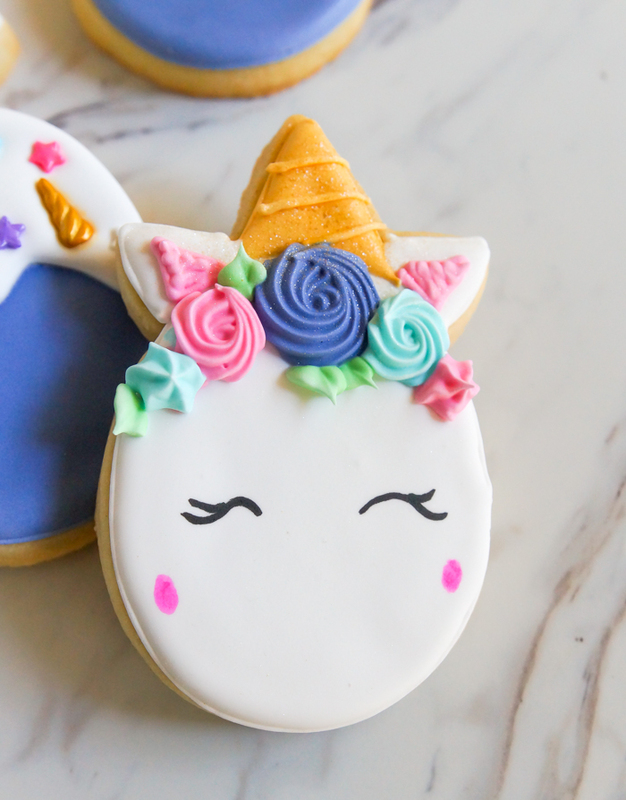 The second I peeped this darling unicorn egg kit, my brain shouted, "COOKIES!" 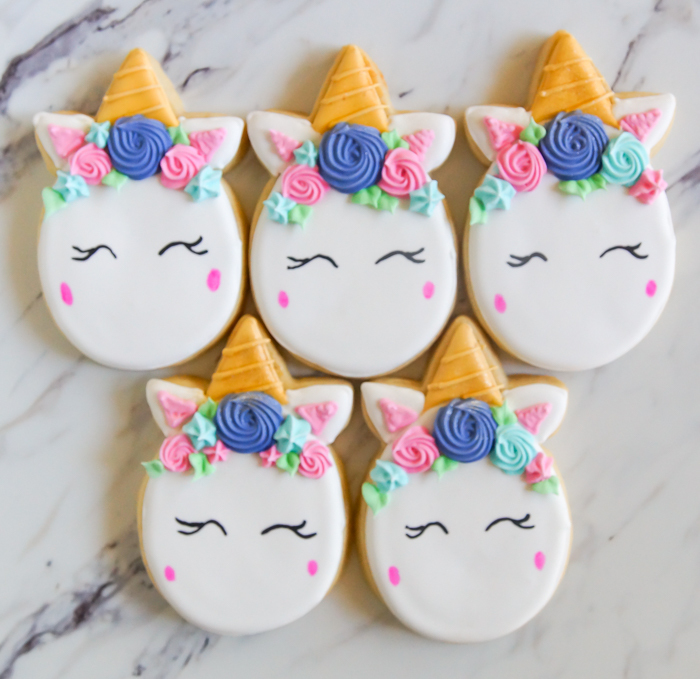 My niece, Rosie, is really INTO unicorns at the moment, so I thought she'd appreciate these...and possibly share with her brothers. 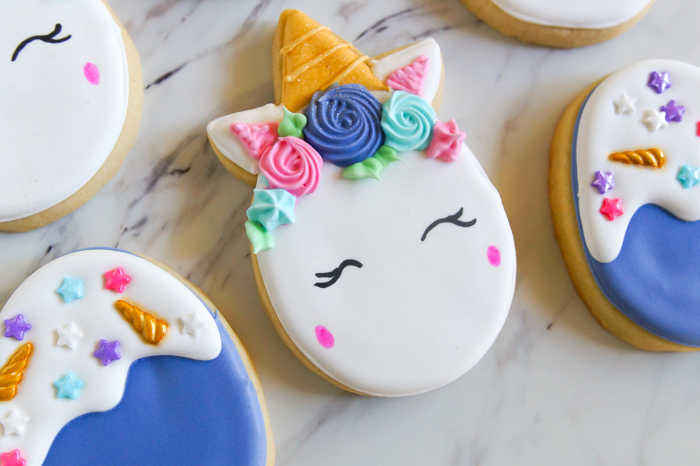 If you have a unicorn lover in your life, these would be especially cute in an Easter basket. They're pretty easy to make. I'll show you. 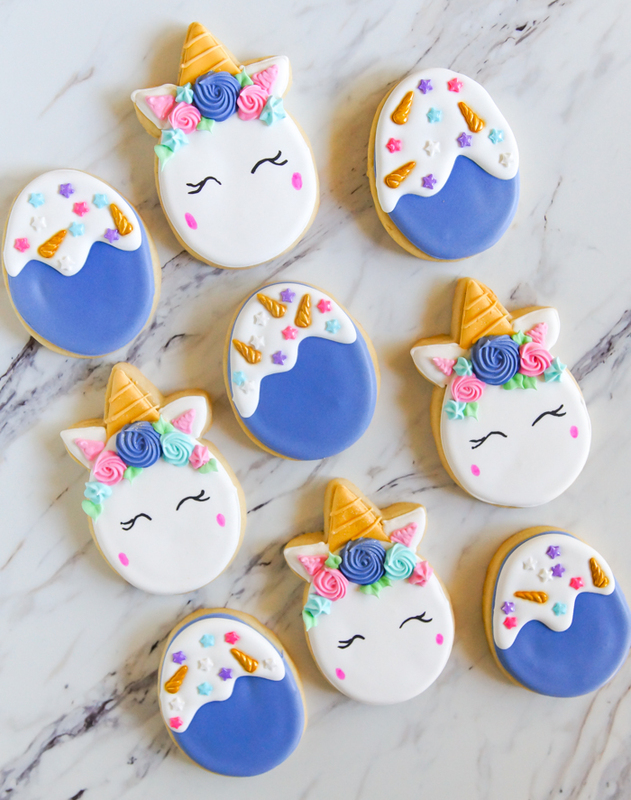 I also made some unicorn sprinkle eggs to go with them. I mixed two sprinkles from Sweet Sugarbelle's line, and they are just perfect! 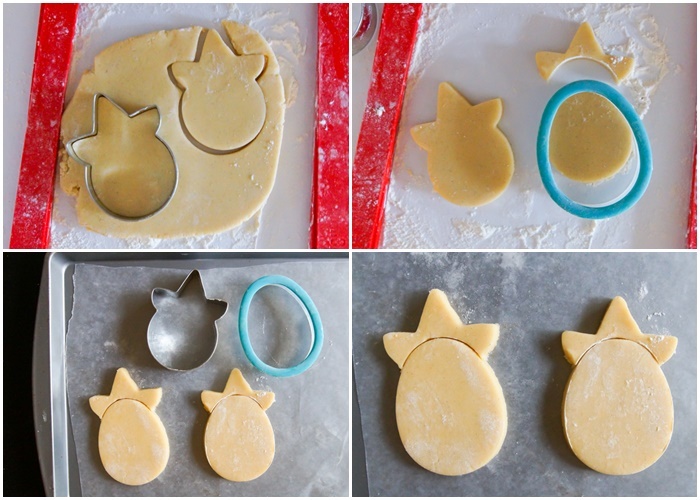 To make the unicorn egg shapes, you'll want to piece together two cookie shapes. 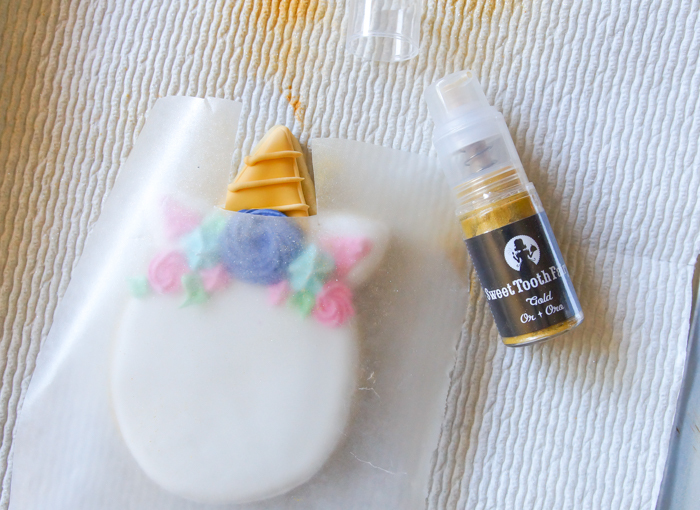 I'm using LilaLoa by Ann Clark Unicorn Face cutter for the top and a plain egg shape for the main part. 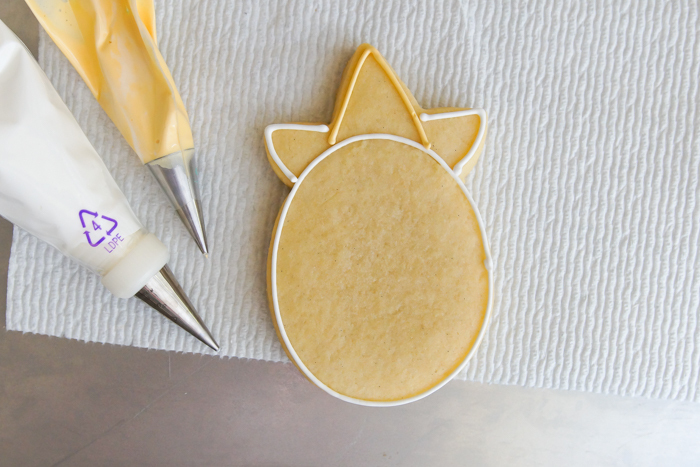 You could also use cat ears from a cat cookie cutter and hand-cut the horn, or hand-cut all three of the top pieces. 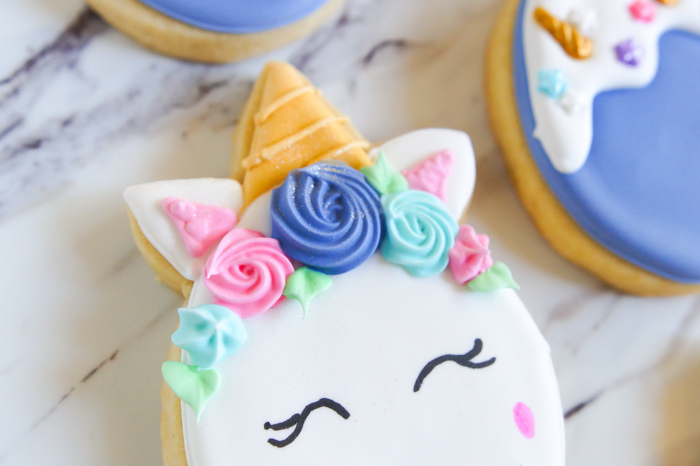 To make the shapes fit together nicely, cut out the unicorn faces first. 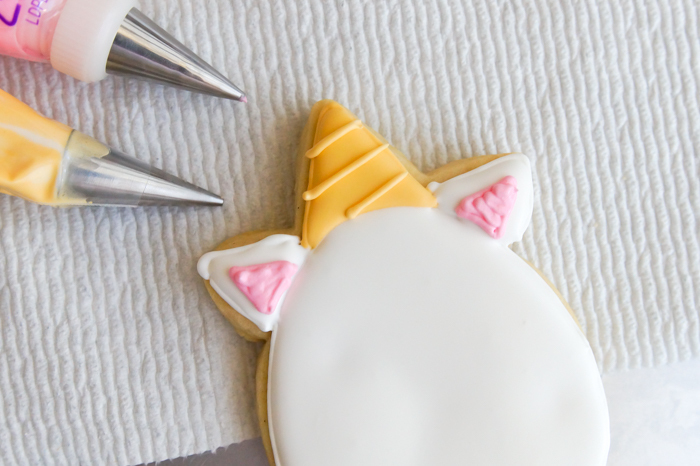 Use the top of the egg cutter to cut away the bottom of the unicorn head, leaving only the ears and horn. (Re-roll the scraps.) 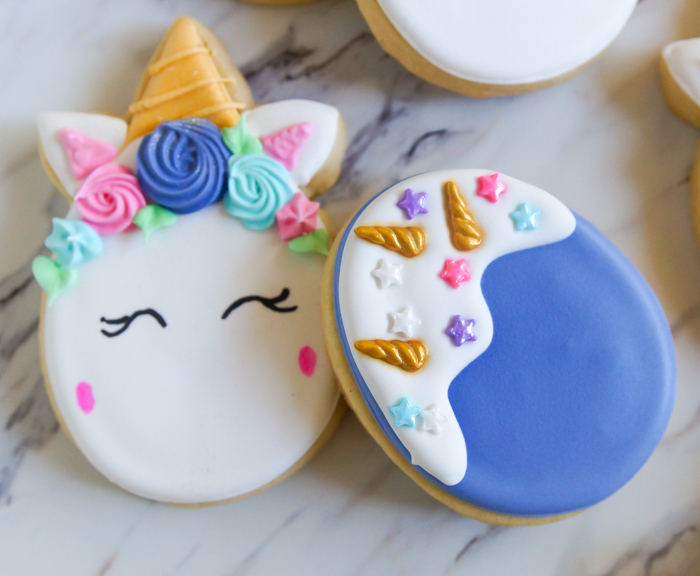 Place the unicorn ears/horn on top of the egg cookie shape and freeze. This will help the pieces stick together once baked. After about 10 minutes in the freezer, bake as usual. 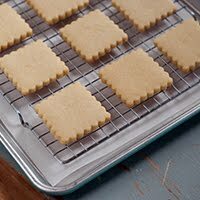 For these cookies, I used my perfect every time cut-out cookies, but I omitted the extracts and used 2 teaspoons vanilla bean paste instead. 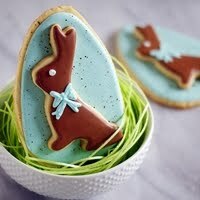 A little nod to speckled eggs for Easter. I rolled these to 3/8" for substantial, thick cookies. 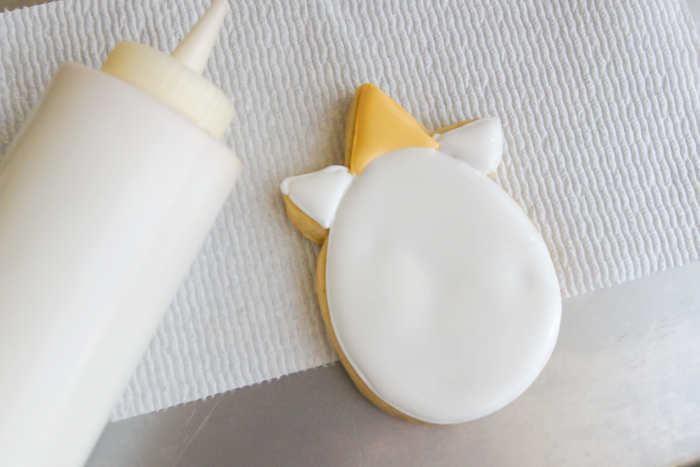 Using #2 tips, outline the egg, ears, and horn in white and gold icing. 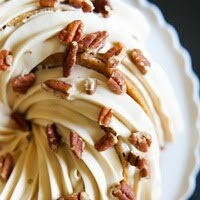 Thin the remaining white and gold icing with water a bit at a time until a ribbon of icing dropped back into the bowl disappears in a count of 2-3 seconds. If too thin, stir in sifted powdered sugar. Cover with a damp dish towel and let sit for several minutes. Stir gently and pour into squeeze bottles. Fill in the outlined area, using a toothpick to guide to edges and pop large air bubbles. 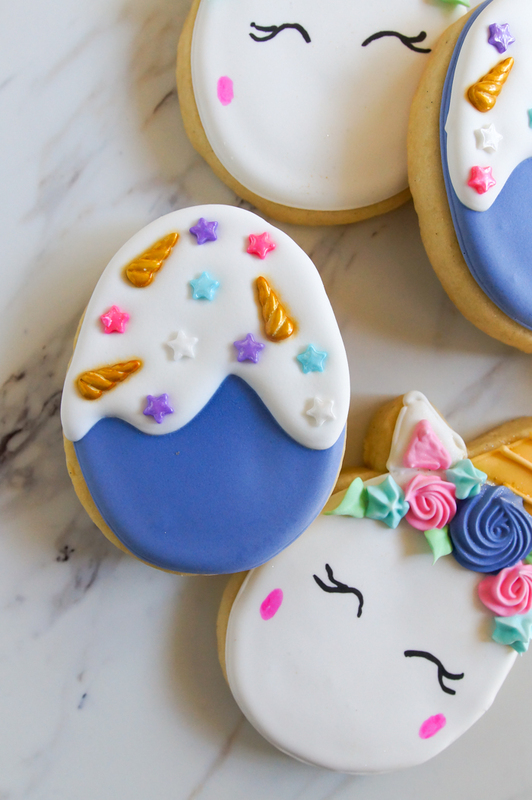 Let the icing dry at least 1 hour. 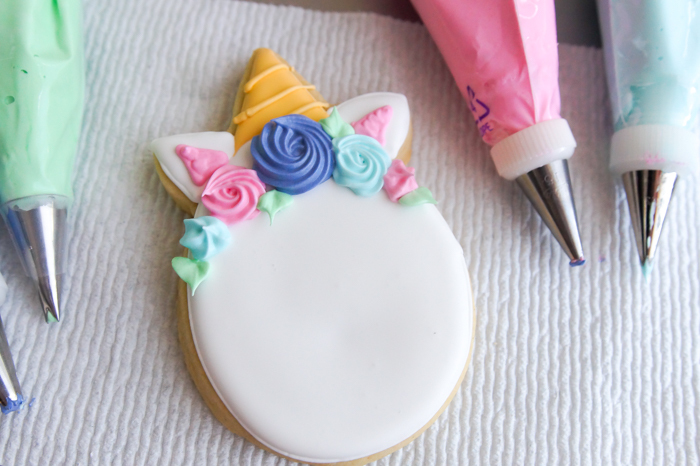 Use the piping consistency gold icing to add lines across the horn. 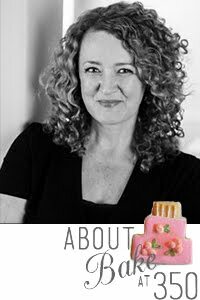 Use a #2 tip and pink icing to add pink to the ears. Use a leaf tip and green icing to add leaves. Let the cookies dry uncovered for 6-8 hours or overnight. 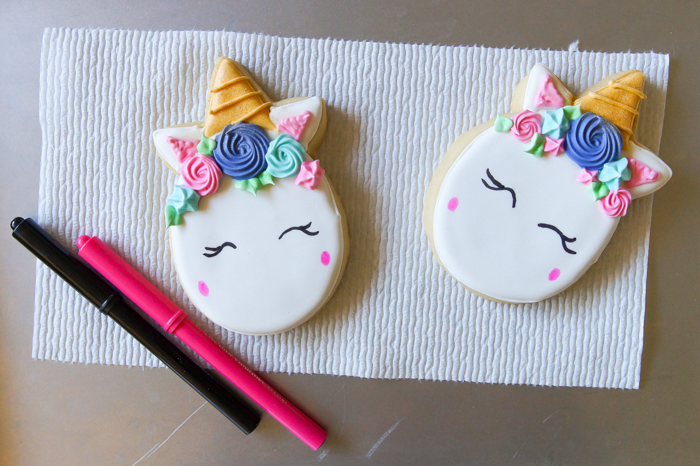 Use food coloring pens and add eyes, lashes, and pink cheeks. 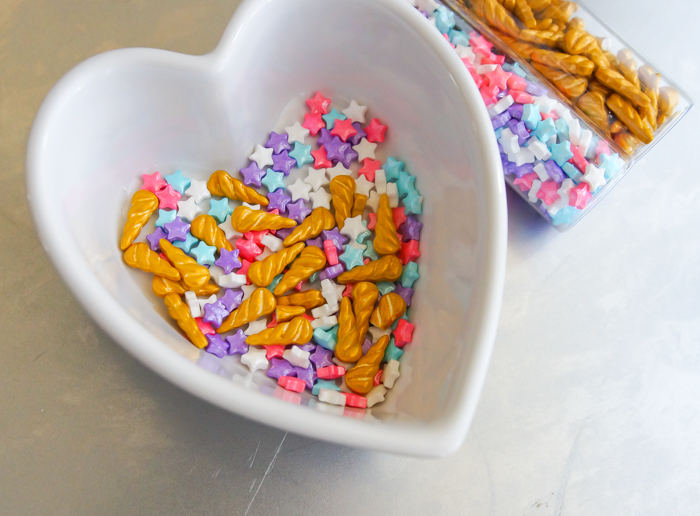 For the sprinkle eggs, outline and fill the entire egg in purple. 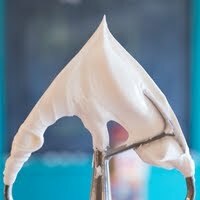 Let the icing dry for at least one hour. Outline a squiggle of icing on top of the purple. 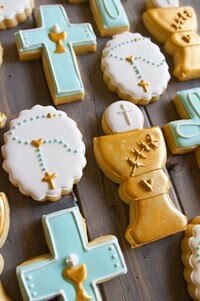 Fill with white icing. Add sprinkles. Let dry completely. 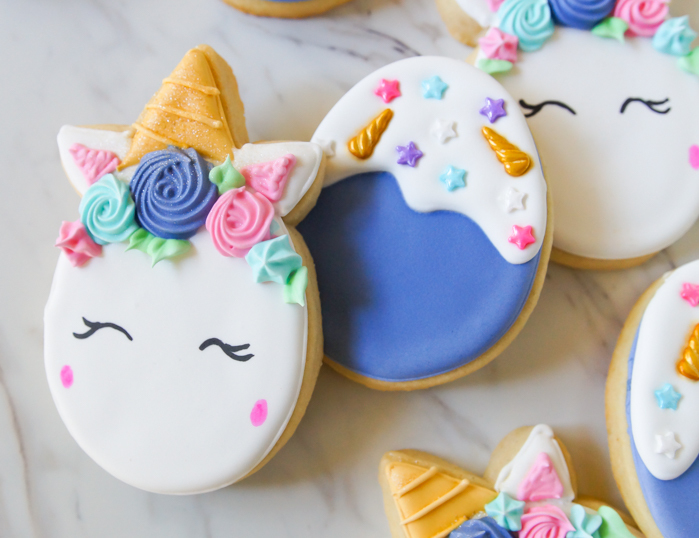 Do you have a unicorn lover at home? these are so cute!!!!! make more of these please and thank you! This is awesome. Thank you for sharing very detail info. wonderful Narration!